Physics breakthrough: Is the universe a giant hologram? Scientists have found the “clearest evidence yet” that the universe we inhabit is a giant hologram, paving the way towards reconciling one of physics’ most pressing issues: the relationship between Einstein’s theory of relativity and quantum physics. In other words, we could be living inside a giant 3D projection of what is actually a two-dimensional space, similar to an IMAX movie theater screen or a painting. Or one could simply imagine the experience of looking at a three-dimensional object from various angles and seeing it change shape according to the point of observation. 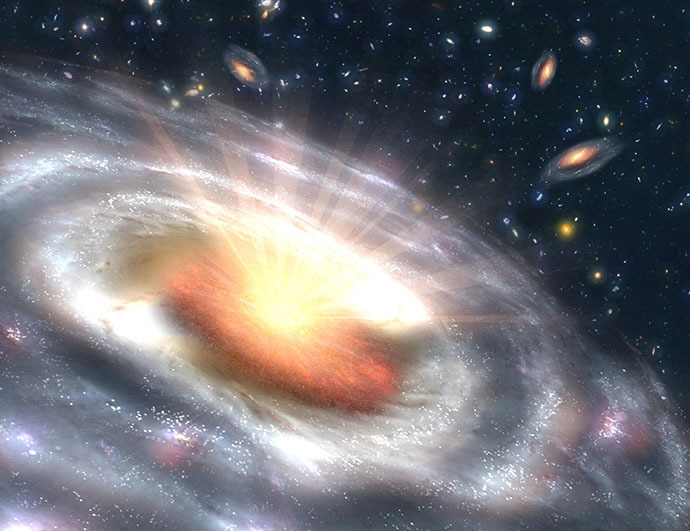 The new experimental simulations proposed by Japanese scientist, Yoshifumi Hyakutake, and his team at the Ibaraki University of Japan tackle the varying energies of black holes discovered in parallel universes. But it also goes a long way towards marrying Einstein’s theory of general relativity and the theory of quantum mechanics as the two main theories describing our universe. The findings were published in the journal, Nature, on December 10. In physics, the ‘holographic principle’ is a property described in string theory. It represents a volume of space whose entire information can be imagined as encoded on a boundary of that selected space. The holographic principle started by first observing black hole thermodynamics. There, it was noticed that the informational content of all the objects that got sucked in by the hole can be seen in a scaled sense on the hole’s event horizon. Einstein, in his collective theorizing, posited that space and time are related and should be considered and calculated in relation to each other, and that the measurements of objects will be relative to the velocity of the person observing them. It is very empirical and observable. Quantum mechanics, on the other hand, deals with particle behavior on an infinitely small scale and therefore cannot belong in Einstein’s empirically testable worldview for the simple reason that it is too abstract and theoretical. Though both suffer from certain inconsistencies: Einstein’s theory, for instance, breaks down when one imagines the middle of a black hole – an object in which time and space both collapse – the theories have been competing each other and generally hardly viewed as parallel. Scientists have been looking for a linking theory. Hyakutake’s model explains some inconsistencies between the two big models, furthering the research first carried out in 1997. Then, theoretical physicist, Juan Maldacena, catapulted ‘string theory’ into the spotlight providing a reliable realization of the holographic principle. That theory – which is widely said to explain the nature of everything – believes that the universe is made of tiny, immeasurable ‘strings’, or one-dimensional objects that vibrate and fluctuate, and in so doing account for the activity of all matter and time. The theory goes that the strings exist in nine dimensions of space and one of time. But because their scale is so difficult to measure – and yet they are believed to control everything – they are said to ‘project’ their activity onto a much simpler, flat space with no gravity whatsoever. This produced a world without gravity laws. However, it did not yet prove the universe is a hologram. Furthering the string theory, Hyakutake wrote two papers. In one, he measures the internal energy of a black hole – specifically, the place where the hole meets the universe, otherwise known as the ‘event horizon’. He measures the activity of its visible properties (made up of visible particles) based on string theory and the effects of virtual particles, which at times appear and then disappear – many scientists even consider them a purely mathematical tool. In the second paper, Hyakutake and his team calculated the same activity at lower dimensions (without gravity involved) and the results matched the measurements of the first paper. The two new papers take Maldacena’s findings further by proposing an extra dimension. That tenth lower dimension has no gravity and its particles neatly line up in a set of strings oscillating in harmony, attached to one another – and not in chaos, which is what we had until now. And now, the scientists finally seem to have laid hands on mathematical proof that the universe can be measured according to both approaches – one that involves gravity and one that does not. If they are as identical as they seem, Maldacena himself predicts that we could one day use just quantum theory alone to explain the nature of everything in the universe. “They have numerically confirmed, perhaps for the first time, something we were fairly sure had to be true, but was still a conjecture — namely that the thermodynamics of certain black holes can be reproduced from a lower-dimensional universe,” said Leonard Susskind, a theoretical physicist at Stanford University, California, who was one of the first proponents of the theory of the universe as a hologram.